I'm back with a card I made because I wanted to use the stamp. but I like how it turned out! 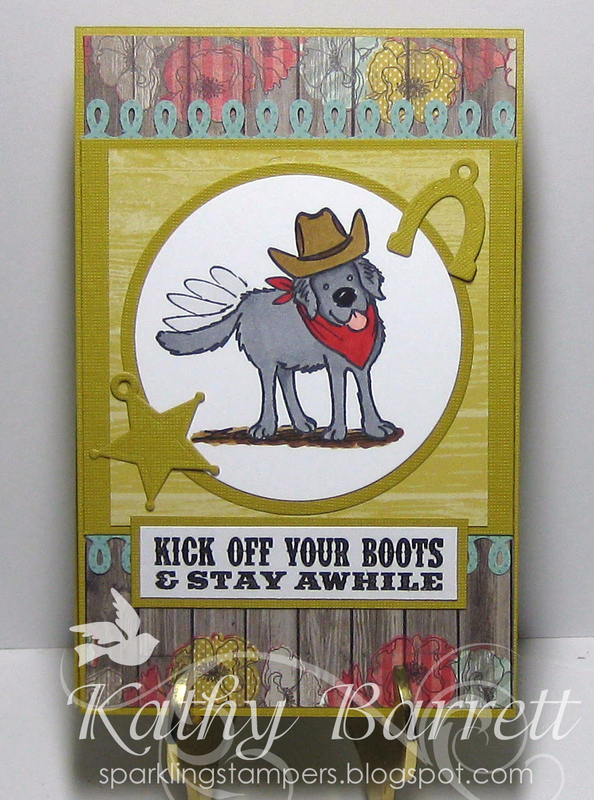 I used the sketch at Die Cut Divas. The stamp is from Copper Leaf Creations and it is one that I picked up on one of my trips out-of-state. He's a cute little guy, don't ya think? Happy, for sure! I used Nesties, MFT dies for the star and horseshoe charms, and a Martha Stewart punch for the loopy borders. The sentiment is from MFT, The dp is MME Dolled Up and the cs is DCWV. Thanks for stopping by! Margaret will be here tomorrow! A great card. Love the western feel to it. What a sweet image, great card!!! Thanks for playing with us this week at QKR Stampede. I LOVE this doggie (Wish I had him) and I love the paper you chose. It's one of my favorite sets. This is such a cute card! Really cute card. Love the colors. That doggie is adorable.